Plus, a new burger joint for the Grand Lake 'hood, and the Michelin Guide's budget picks. It's a well-documented fact that, even here in the vegetable-loving Bay Area, finding a restaurant that will please a mixed group of vegans and omnivores isn't always an easy task. And, even as "Meatless Mondays" gain traction, trying to convince a dedicated meat eater to willingly choose a vegetarian entrée (or restaurant) can often seem like an exercise in futility. That said, here are four vegan dishes, served at non-vegetarian restaurants, that just might do the trick. Note: Some of these restaurants aren't open on Mondays, but when vegan food tastes this good, it might inspire you to keep Tuesdays or Wednesdays meatless, too. 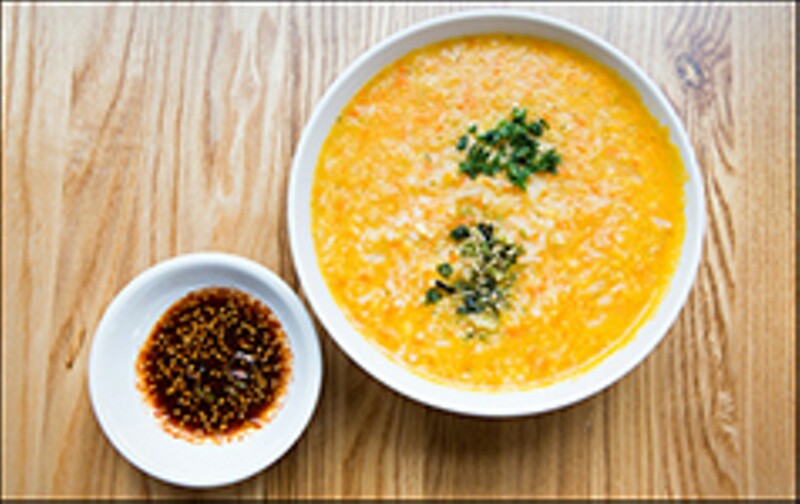 The vegetarian version of Spoon's signature dish, juk (a Korean rice porridge that's often made with milk), is dairy- and gluten-free. It's also delicious — loaded with the natural sweetness of minced carrots. Enjoy your juk with complimentary banchan (side dishes) for a light lunch, or add an order of glazed, deep-fried potatoes if you're feeling decadent. As an added bonus, Spoon's excellent kimchi (whose che base builds flavor through the use of oranges, apples, and pears) is also vegan. Juhu is best known for its pavs, or Indian street-food-inspired "sliders," which chef Preeti Mistry serves on custom-made Starter Bakery buns. The vada pav, which I once declared a "starch-on-starch masterpiece," features an airy, deep-fried potato fritter, pickled red onions, and a fiery, ghost-pepper-spiked tamarind chutney. I might like the vada more than any of Juhu's meat-centered pavs, and, given that one of those is filled with braised short rib, that's saying a lot. Abura-ya is the most vegan-friendly fried-chicken pop-up that I'm aware of, and, as good as the chicken is, I sometimes get a specific hankering for the organic tofu — thick, dense cubes that are dredged in cornstarch, fried, and then tossed in the sauce or spice mix of your choice. Order one of the excellent izakaya-style vegetable side dishes, too, and you've got the makings of a hearty meal. Venga's seasonal vegan paella, made with vegetable stock and — gasp — basmati rice, is about as non-traditional as paella gets. But if what you're in the mood for is a rice dish that's loaded with fresh produce (sugar pie pumpkin, dino kale, persimmon, and chiles de arbol during one late-autumn visit), this should hit the spot. Plus, as far as paella goes, the $10 price tag is tough to beat. Here's good news for those who lamented the Kwik-Way's sudden (and rather dramatic) departure from Oakland's Grand Lake neighborhood: There's a new burger joint on the block. Open for about three weeks in the former Kung Pao Kitchen location, JJ Burger (3415 Grand Ave.) specializes in six-ounce char-broiled Angus beef. It's the first restaurant for owner Joseph Huang, who spent the past four years working as a line cook in big hotels. According to Huang, the menu at JJ Burger is similar to what you'd find at a diner: burgers, onion rings, milk shakes, and the like. But the burgers are a step up from your typical fast-food offerings in that they feature brioche buns, fresh produce, and custom toppings. They're also slightly more expensive — $8.50 for the average burger, or $10.50 for a combo that comes with a drink and skinny fries. The other distinction is the number of burger options for non-beef eaters, which include chicken, turkey, fish, and veggie burgers. There's even a Hawaiian-style ahi poke burger: cubes of raw, marinated yellowfin tuna and a seaweed salad on a burger bun, with wasabi sauce on the side. As an opening promotion, the restaurant gave away a scoop of green tea ice cream with every combo meal, and the feature wound up being so popular that Huang decided to extend it indefinitely — except that now customers can pick whatever ice cream flavor they want. JJ Burger is open Tuesday through Sunday, 11 a.m.–9 p.m. The Bib Gourmand designation is meant to recognize restaurants at which you can get two courses and a glass of wine or dessert for $40 or less — though that often feels like a somewhat arbitrarily applied benchmark, as a handful of restaurants on the list are truly budget-friendly, while others are quite expensive. Be that as it may, the other East Bay restaurants that made the cut this year are Bellanico (Oakland), Chevalier (Lafayette), China Village (Albany), Comal (Berkeley), Corso (Berkeley), FIVE (Berkeley), Gather (Berkeley), Great China (Berkeley), Ippuku (Berkeley), Iyasare (Berkeley), Michel Bistro (Oakland), Ramen Shop (Oakland), Rivoli (Berkeley), Thai House (Danville), and Wood Tavern (Oakland).